(CNN) -- Jorge Lorenzo upstaged world champion team-mate Valentino Rossi to claim pole position for Sunday's Italian MotoGP at Mugello. Spanish rider Jorge Lorenzo is seeking to extend his overall lead over world champion Valentino Rossi. Lorenzo, who leads Rossi by one point in the world championship standings, was the only Yamaha rider on the front row after clocking a time of 1 minute 48.987 seconds with a stunning penultimate lap. Rossi was left back in fourth place -- 0.161 seconds behind the Spaniard -- as he was also headed by former world champion Casey Stoner in second and fellow Italian Loris Capirossi. Rossi has won the last seven MotoGP races at Mugello, and this will be the first time he has not started on the front row of the grid there. Australian Stoner, who was quickest in morning practice, was just 0.021 seconds adrift of Lorenzo on his Ducati, while Capirossi was 0.134 back on his Rizla Suzuki. French rider Randy de Puniet qualified fifth to be the top Honda representative, with Monster Yamaha Tech 3's Colin Edwards of the U.S. just behind him in sixth. Honda's Dani Pedrosa, who hurt his leg in Saturday's earlier practice session, finished back in eighth. 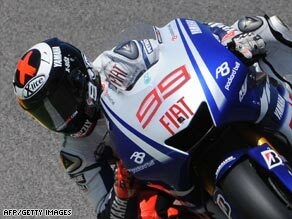 Lorenzo is confident of achieving a strong result on Sunday. "I feel satisfied with the pole position," he told MotoGP.com." It is important to be on the front row and get a good start here. We have good pace on the harder (race) tires and it looks like we will have the chance to fight for the podium and maybe the victory. "We know the Italian riders are very fast here because they are highly motivated and they want to win, but we are also very competitive and we are confident on the bike." Rossi was disappointed to miss out on a place in the front row, but was looking forward to making up the deficit despite a forecast for bad weather. "The weather situation is very important because if it's like this (sunny) then we know we are fast but if it changes, which seems possible from the forecast, then it will be a bit more difficult," he said. "Our setting is good, we have some small details to check but our race pace with the harder tire is very good so I am not too worried. Of course, starting from the second row makes life a little more difficult but we don't think about this."